Bonfire of the Vanities: Veni, Domine! The time of coming is upon us again; the time to be aware just how near our immanent-yet-supra-Cosmic Lord and Savior is, truly and always. This is the time to realize that the Eschaton is less than a hairsbreadth away. "Come, Lord Jesus, and do not delay," we pray in First Vespers--and while we are tempted to think of Christmas, the focus more is on his ultimate coming: at the end of time (which can be at any moment), or at the end of our lives -- again, at any time. But we are called, likewise, to consider that the Eschaton -- that is, ultimate reality -- is always immanently here, although we remain unaware. The Eucharist is the "portal": the appearances of bread and wine are the barest film of temporal reality separating us from complete Reality, where the Trinity is encountered, and the Incarnate One reigns in his proper glory. My thoughts turn to this, as I observe the Holy Father celebrate First Vespers, from St. Peter's Basilica (taped from earlier). My prayer for my parishioners, and for you, is that Advent will be a time to nourish longing in your heart for the One who is to come. Msgr Peter Elliott in 'Ceremonies of the Modern Roman Rite' No. 132 "...The classical Roman tradition is to use a reddish purple for violet, rather than the purple with a blue tone which is so widely seen today. " Thanks -- I'd forgotten about that part in Eliot's book, which I own. My point was that there are folks who argue you're supposed to have two sets of purple vestments, etc., and the "red-purple" is for Lent, not Advent. Apparently, the Holy Father didn't get the memo. The use of a blue-violet for Advent is common to the old Saurm rite in merry olde England, hence the term "Sarum blue" to describe it. That aside, I gotta tell ya, that is one nice looking cope. I sometimes amuse myself by playing Socrates to the good-hearted people who go off to some silly liturgical conference where they're told that there are two liturgically distinct violets. 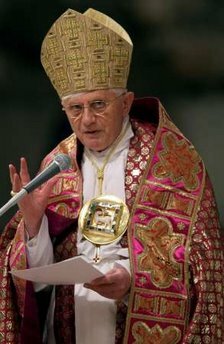 They're usually shocked to learn that there's not a shred of law, custom, or tradition for such a distinction in the Roman Rite, and that sartorial choice is the only reason for the different shades of violet. That said, I'm all in favor of having two (or three, or four) sets of violet vestments.